Multiple-Column Allwins, Fill em Up, Whats My Line, Many Happy Returns, etc. 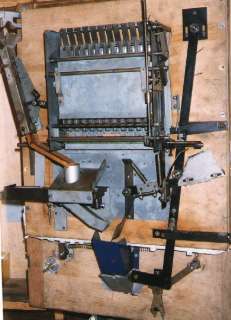 The Multiple-Column Allwin was also very popular. This type was much larger than a standard Allwin, and contained around 40 balls. Instead of shooting a single ball into number of winning cups, the gameplay was much more sophisticated. The centre of the playfield contained around twelve columns of balls stacked up on top of one another. The idea of the game was to completely fill up any of the columns. Each column was a different length, and would pay out a different amount depending on the number of balls in the column. After the payout, all the balls would be emptied out of the winning column, and that column would then start again. The player was only given one ball for each coin inserted, but the lure of all those columns of balls meant that he kept inserting coins until he had filled one column, by which time some of the other columns would be nearly full so he just had to try and fill those as well! These Allwins are very popular with collectors as they are great fun to play, and the game is always changing as the various columns of balls fill up and empty again. The mechanism is very ingenious, and relatively complex for an Allwin. 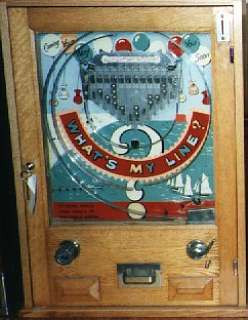 This machine is one of the few Allwins to be equipped with a bandit-type payout slide mechanism, necessary because each of the columns pays out a different number of coins for a single rotation of the payout knob. 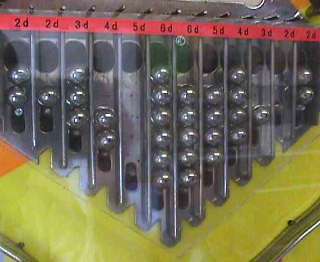 In operation, when one of the columns of balls is full, the top ball falls back into the mechanism and releases the payout knob on the left-hand side of the machine. 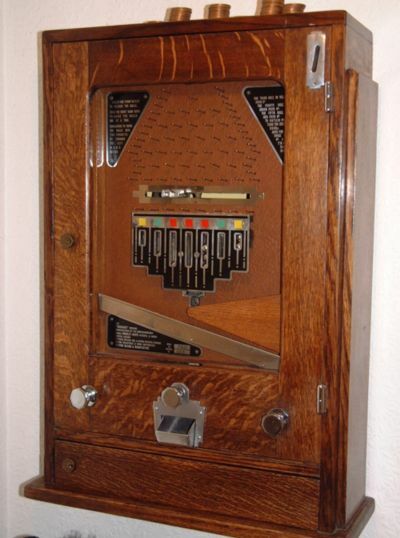 As the knob is turned by the player, all the balls in that column are released, and disappear down the losing hole in the playfield, thereby emptying that column. A complicated system of levers and rods detects the position and value of the winning column, and engages the payout finger with the appropriate payout slide(s). Further rotation of the payout knob then pushes the slides across, to deliver the required number of coins to the player. Two of the most common multiple-column Allwins. The Fill 'Em Up and the What's My Line. These were produced for Ruffler & Walker (I love that name!) who also marketed the Many Happy Returns version. All these Allwins were the same, except for the different pictures on the backflash. Notice that the ball columns are different lengths, with the longer columns in the centre paying out the most. Close up of ball columns. The winning ball drops through the hole at the top of each column to trigger the payout mechanism. The mechanism of a multiple-column Allwin. This looks simpler than it actually is. 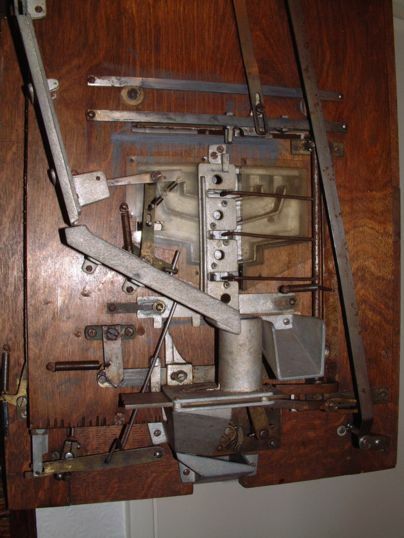 Most of the complex mechanism is hidden behind the metal plate in the centre of the picture. This is directly behind the stacks of balls. There are 45 balls in this machine, but not a single one is visible in this picture! Most of the balls are stacked up in a zig-zag runway awaiting their turn to be fired around the playfield. The Bradley Crusader. Not strictly an Allwin, but a Multiple-Column machine with similar gameplay. 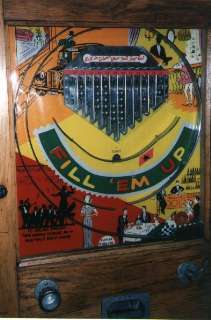 Here, the balls drop from the top of the playfield, through a pinfield, and can be diverted with a moveable paddle. The major difference is that all the columns are emptied at the start of each game and the player is given multiple balls to try and fill as many columns as possible.